It’s difficulty to remain consistent when you’ve written as many reviews as I have. An opinion I state in one may be contradicted 6 months later, and there’s a simple reason for that, I’m human. My opinions change and evolve and my experiences over time shape my interests and wants from gaming and other aspects of my life. I’ve praised and damned games over my years of writing for their difficulty. Some games are difficult because of bad balancing, others are difficult to draw out a short game or force the player to require skill, and others are difficult for their sense of nostalgia. Rive falls into the latter, mostly, when you boot it up your only option is hard mode, that’s it. Says a lot really. To define Rive is difficult. On the face of it Rive is a platformer, but it has sections and elements inspired by Asteroids or Dodonpachi and finally there are very small hints to games like Metroid in there. All of this is topped off with a self-aware meta humour poking fun at pop culture where ever possible, see: Austin Powers references in the death screen. 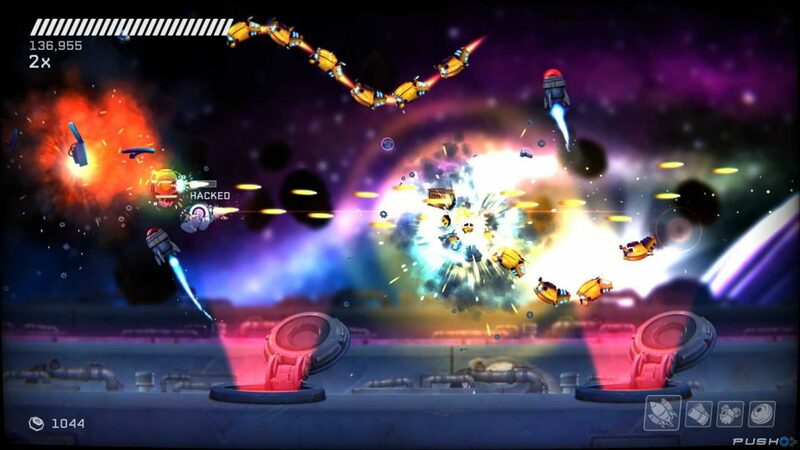 In Rive you are a salvager looking to pull apart a massive ship. Unfortunately said ship is filled to the brim with robots who lean on the dickhead side of AI. In massive swarms robots will fly at you. With one stick on the controller you’ll move around and with the other you can spray fire you somewhat weak machine gun. As the game progresses you can spend scrap you pick up from dead enemies to get special attacks ranging from mass missiles to a weird ricochet shot. 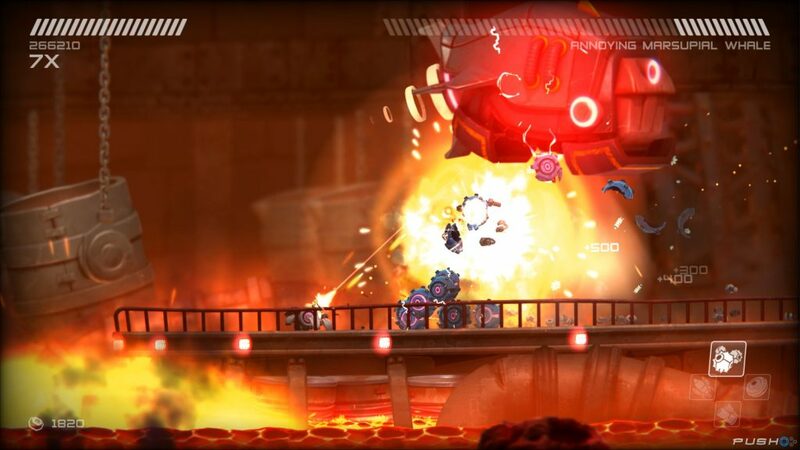 Rive is a tough game, it’s set pieces and boss fights are all designed to see you die. The checkpoint system is generous but that won’t help you kill the 150 enemies flying at you repeatedly. 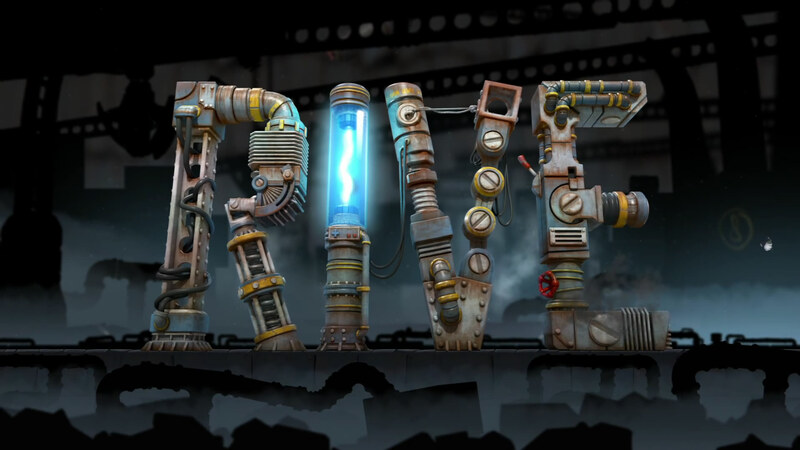 There are only two ways to beat Rive, trial and error or luck. Rarely will even the quickest reactions be able to get you through a particular area, you need to know the path or know the enemy routine to be able to start shooting before they turn up. Early on traps are obvious, you’ll see a falling metal pillar well before it comes down but later on in the game it almost becomes unfair. You’re forced into arduous and tricky situations that you may somehow get through by the skin of your teeth only for Rive to take great pleasure in spewing enemies directly onto your little walker bot from a pipe hidden into the scenery. Situations like this aren’t rare and there are a number of sequences where something like lava is chasing you through air vents and you have no choice but attempt, die, rinse and repeat until you know the only route through the maze that doesn’t end in molten death. Graphically Rive ticks all the boxes you would hope with a game like this, explosions are satisfying and debris is sent flying everywhere at a high rate like a fireworks party at a scrapyard. There are occasions where large numbers of enemies will come at you from all angles requiring you to react quickly to clear house, thankfully this is aided by a framerate that holds up consistently with no jankyness. There are some specialty sections where you get to fly around and cause chaos, these sections are few and far between but are great fun making you wish for more.